The Memoir Club, ca. 1943. The Bloomsbury Group or Bloomsbury Set was a group of writers, intellectuals, philosophers and artists who held informal discussions in Bloomsbury throughout the 20th century. This English collective of friends and relatives lived, worked or studied near Bloomsbury in London during the first half of the twentieth century. Their work deeply influenced literature, aesthetics, criticism, and economics as well as modern attitudes towards feminism, pacifism, and sexuality. Its best known members were Virginia Woolf, John Maynard Keynes, E. M. Forster and Lytton Strachey. 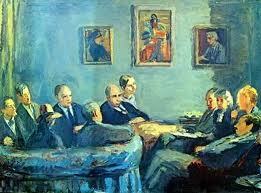 The painting by Vanessa Bell shows their gathering. The man in the reclining chair; nodding off on the right must be E.M. Forster, The black - haired, long - faced woman in the middle could be Virginia Woolf, but is not. On the left, paying some attention, could be T.S.Eliot. ( But maybe I am wrong ). The fourth guy on the right is taking a nap. The third character from the left, wich I first mistook for a pinguin on the run, is a woman wearing a hat. Actually the painting entitled the The Memoir Club, shows hanging from the wall portraits of Woolf and Strachey by Duncan Grant and one of Fry by Vanessa Bell herself. An unposed, seated group consisting of ( left to right ) Duncan Grant, Leonard Woolf, Vanessa and Clive Bell, David Garnett, Maynard and Lydia Keynes, Desmond and Mollie MacCarthy, Quentin Bell and E.M. Forster ( got that one right !) has gathered in a room. Some sit with their backs toward the viewer, some look down, some away. Although the individuals are recognizable, they also blend into a roughly circular group. The Memoir Club is Vanessa Bell's grand historical picture. Her friends merge in space although the portraits of the dead evoke a temporal dimension.